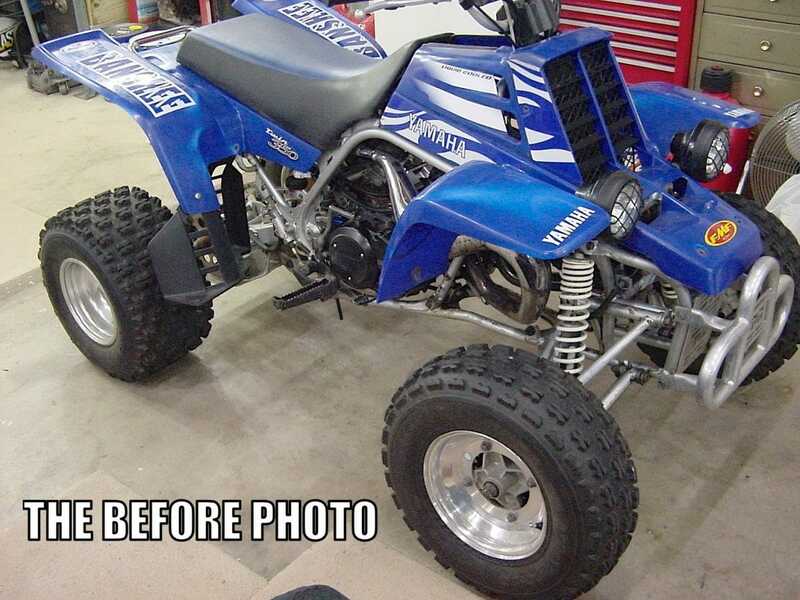 My name is Tony Cooper and I wanted to share some before and after pics of my 2003 Yamaha Banshee build. This is my second submission to Dirt Wheels with my first being a 2011 KFX 450 that made it into your great magazine last year. I bought the Banshee as a project in early 2017. 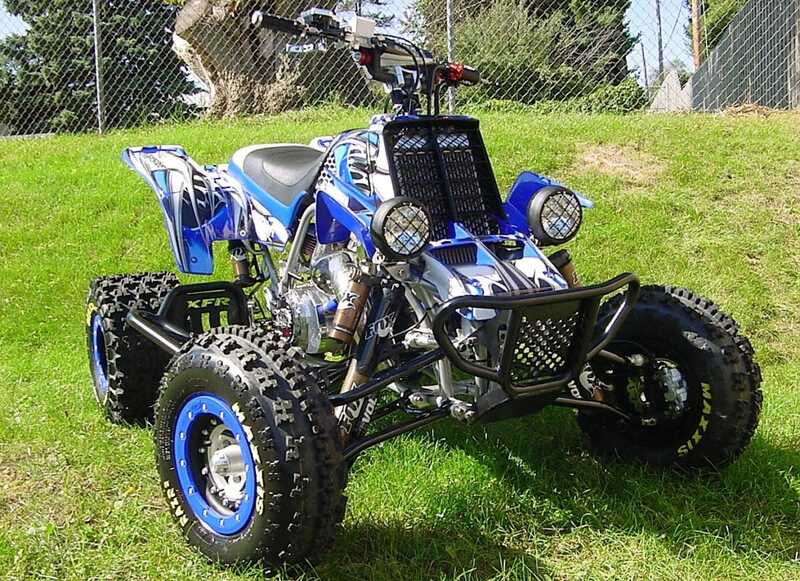 It was a complete and somewhat running ATV, but it wasn’t until I started the tear down that I realized just how much of a project quad I had bought. The only real saving grace was that I got it for a pretty reasonable price. After completely tearing it down and inspecting everything, the only parts left I was willing to use were the gas tank, front spindles, rear suspension link, and transmission gears. The frame, although not bent, had seen much better days so I opted to get a new frame. For the motor, lets just say it was a better boat anchor than anything else. At this point I had to make the decision to scrap it and find a different project Banshee, or resurrect this one and return it to it’s former glory. As you can see from the photos, I decided to bring this Banshee back from the scrap pile and then some. Starting with a new frame I made a gusset kit to strengthen some weaker points on the Banshee frame. I also removed some of the mounting tabs that would no longer be used to clean up the frame a little. The next step was the suspension. Given my plans for the motor I knew I needed a great suspension on this Banshee to help plant the power to come. I chose to go with Fireball Racing for my suspension needs using their EGC long travel front arms that are +2 wider per side and +1 forward and also one of their +2″ swing-arms with a billet carrier. For the shocks I went with Fox Floats in the front and a Fox Podium in the rear. I chose to go with Hiper Tech 3 bead lock wheels mounted to Lone Star Racing hubs in the front and back along with a Lone Star Racing axle. Turning my attention to the electrics of the Banshee, the stock wiring harness was such a hacked up mess it went right in the trash. I decided to do a DC conversion on the Banshee using a JL Engineering DC conversion kit along with a Kompulsive Concepts complete wiring harness. The new wiring harness was work of art and also accommodated moving the CDI box to the front to better protect it. Being this far into the project it quickly came to light this was an all or nothing deal! With that mind set, the wallet was left open and I stopped looking at receipts. To help control this thing I went with a Lone Star Racing +1″ taller steering stem, FAST Flexx bars, and ASV levers. Bringing the Banshee to a stop was also an important area that needed addressed. To handle those duties I upgraded to 2008 YFZ 450 front dual piston calipers and matching master cylinder utilizing Galfer brake lines and Tusk rotors. The great thing about this upgrade is that it’s a direct bolt on to the Banshee. Moving to the appearance side of things gave me some options as far as what brand and race cut or factory style with the fenders. I’ve always liked the look of the stock Banshee but there was something that needed tweaked. 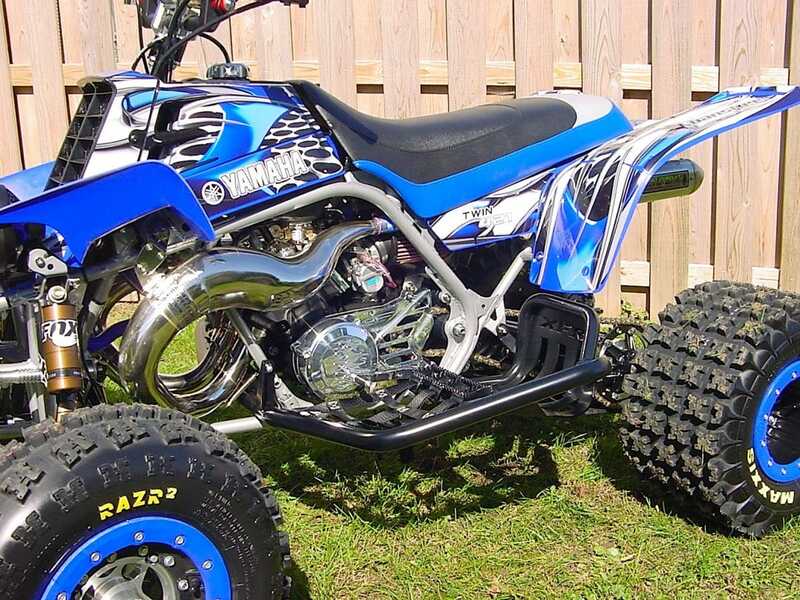 Replacing all the plastics with OEM Yamaha parts and mounting them up I started messing with the front fenders. After some cutting I finally arrived at a point that seemed spot on for what I thought a Banshee should look like. 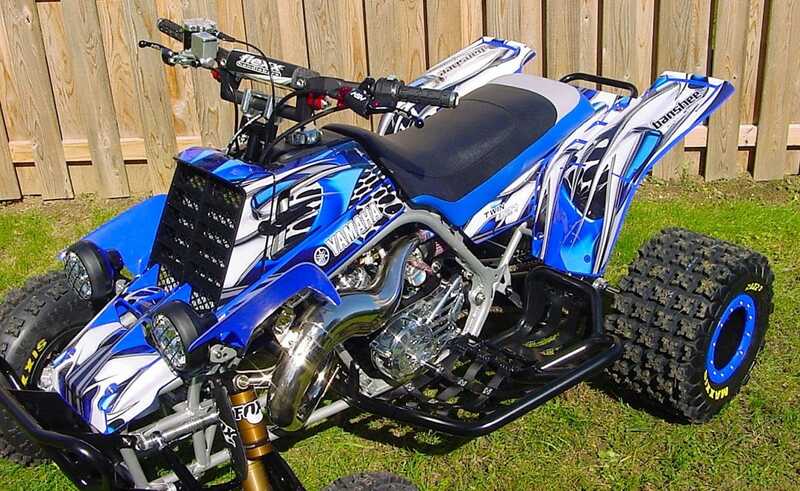 I hit up All Motor Graphics for a custom set of graphics to cover the plastics with. The stock seat was in pretty good condition but I wanted something that looked a little better. I contacted Cascade Innovations/Top Dog Racing and worked out a design, and sent the seat off to them for new foam and cover. They returned a great looking seat that is far more comfortable than the stocker and with the added gripper material will help keep me planted in it. With the majority of everything else done it was time to focus on the motor. My focus was something that is fun to ride providing great all around power. I turned to Cameron at Redline Racing to handle all of the motor work for my Banshee. What we came up with is a pump gas friendly 421 Serval top end with a +4mm stroke Hot Rods crank, Direct Drive lock-up clutch with a Chariot clutch basket and straight cut gears. Taking care of breathing duties is a pair of Keihin PWK 33 carbs mounted to UPP intakes and V-Force 4 reeds and Pro Circuit Platinum pipes and silencers for exhaust. Cameron did a fantastic job on the motor and the dyno numbers were a pleasant surprise showing 90 hp and 53 ft-lbs of torque. After a couple quick rides to check everything out I can already tell this Banhsee turned out exactly how I hoped it would. The low end power is great, only needing the smallest throttle input to leave from a dead stop. Once rolling the power is immediately felt and keeps your hands FIRMLY grasping the handle bars! The end result, is a Banshee resurrection that I’m happy to have completed. We love to get letters and photos like this from Dirt Wheels readers. 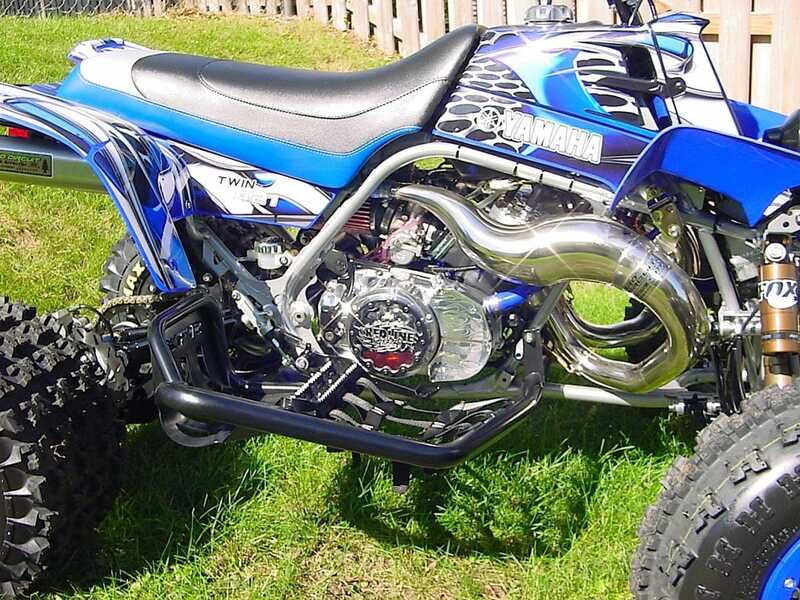 We’re always eager to see what they ride and how they modified it. Perhaps you could do what Tony did. 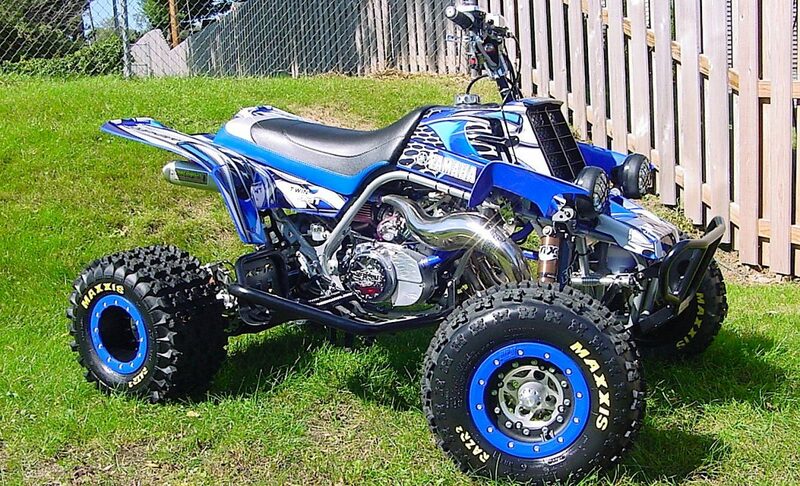 Take some good photos of your ride, write up some specific info on what you did to it, and then E-mail it to us. 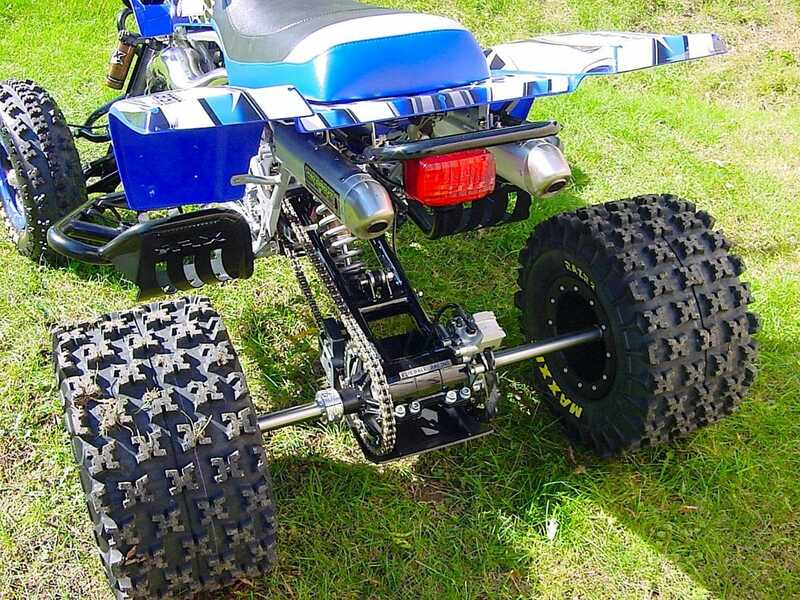 Along with the sport quads, we’d like to see some good 4×4 quads too, as well as your UTV projects.